My plan for a long weekend in Paris was to see and experience as much of the city as possible, this didn’t leave much time for sitting around, so eating on the go was the order of the day. However I took note of Wendy’s wise words in last week’s blog and made sure I ate healthy ‘on the go’ food. First, I have a non-foodie tip; most European major cities have free museum days on the first Sunday of the month so it’s worth planning a trip around that. I did this in the summer for Barcelona and again last weekend when I headed off to Paris. The beauty of this is that you get to see all the fabulous museums and culture for free which means you can spend more money on the delicious cuisine! There are lots of cafés to choose from but I opted for the little pop up stalls where you can see the food being prepared fresh in front of you. One stall had gathered a small crowd to watch how the crêpes were made. There were three people working in the stall yet they’d developed a system to be able to take orders, prepare and serve the constant queue. Choosing a crêpe was difficult, there’s the standard Sucre (sugar) or there are fruit, chocolate and savoury options! We opted to share a strawberry and chocolate crêpe, just the thing to warm us up on the cool Paris night. It was a delight to be able to walk around with hot food and enjoy the sights, and when I say walk, boy did we walk! The metro system is fantastic but you stumble upon so many hidden gems by strolling around the city. We were lucky enough to get into the Louvre for free after only a thirty-minute wait, which we realised wasn’t long when we saw the queue later. The museum was stunning and we got a peek at the enigmatic Mona Lisa. Afterwards we walked along the River Seine to Notre-Dame Cathedral and found the famous (according to my tour book) ‘Shakespeare and Company’ bookshop. At lunchtime I had the opportunity to put into practice my GCSE in French when inquiring if the Panini’s were “chaud or froid” but was stumped when the answer I got back was “oui”. It was back to pointing and thumbs up after that! The Panini was delicious, not just the standard chicken but stuffed with sun-dried tomatoes, pesto, salad and cheese. It was also massive so definitely great value for money! Unfortunately I wasn’t brave enough to seek out and try Cuisses de Grenouille (Frog’s legs) or Escargot (snails), there’s something about these dishes that just doesn’t sit comfortably for me, but I more than made up for this by sampling many French desserts. After so much bread and cheese based products I was definitely in need of a salad so on our final day we headed to the famous shopping centre ‘Galleries Lafayette’ where we enjoyed eyeing up all the top end designer gear. We ate a delicious salad in the deli restaurant and then headed to the terrace to sit in the sunshine and enjoy the view over Paris. Although I know I missed some famous cuisine whilst there, I think on a tight time schedule (and on a budget) eating on the go is definitely the ideal way to see the city. 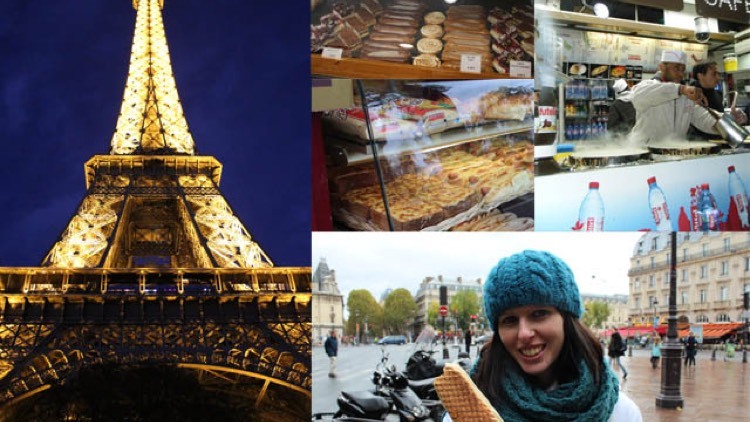 If you’ve been to Paris and have some foodie tips, please comment in the box below, I’d love to know for next time!